Wellness Complete Health Toy Breed recipes are specifically formulated to meet the unique nutritional needs of Toy Breed dogs of all different ages, life stages and lifestyles. Wellness Small Breed recipes are specifically formulated to meet the unique nutritional needs of Small Breed dogs of all different ages, life stages and lifestyles. Wellness Large Breed recipes have been designed to support the unique physical composition and health needs of larger dogs through nutrient-rich whole foods. 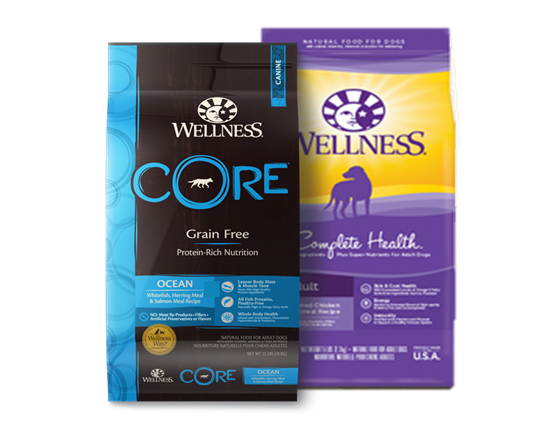 Wellness Grain-Free formulas are based on the nutritional philosophy that dogs thrive on a diet mainly comprised of meat. Each grain-free, nutrient-rich formula provides high quality protein for your dog. Less is More! For some dogs that means eating a simplified diet that uses a unique protein source while removing additional proteins, carbohydrates, fillers and additives. 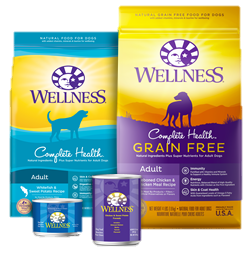 Wellness® Wet Formulas are a delicious way to increase your dog’s moisture intake. They are available in 8 delicious flavors. A variety of natural, tasty treats, power-packed with wholesome ingredients, are the perfect complement to your dog's healthy diet. At Wellness®, we believe that a thoughtful approach to nutrition is the foundation of wellbeing. 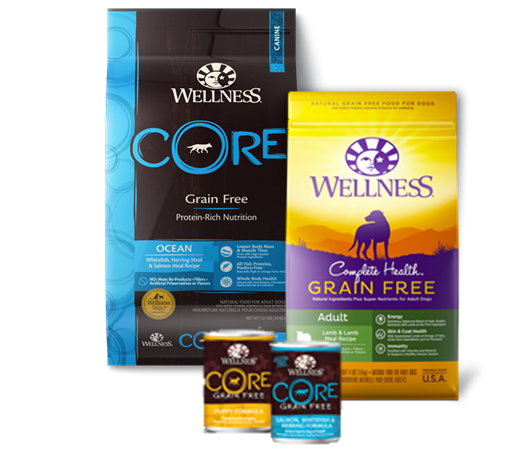 Choose Wellness® as your trusted brand of puppy food in Singapore. We use delicious, real-foods like deboned meats, free of added hormones and steroids, wholesome grains and fresh fruits and vegetables to provide the perfect balance of protein, energy, vitamins, minerals, and antioxidants in the healthiest way possible. Every ingredient in our Wellness natural food recipes is carefully chosen for its nutritional benefits providing just what your faithful friend needs for a happier, healthier, longer life. That’s why all Wellness dog food formulas are free from meat by-products, animal fats, potential allergens like corn, soy and wheat as well as artificial colors, flavorings or preservatives, to provide the best dog food in Singapore and more for your beloved pets. We’ve made it our mission for almost a decade to offer natural, healthful, great-tasting alternatives in pet nutrition. Over the years, we have helped thousands of pets and people discover the difference choosing Wellness can make. And that’s something we’re proud of because we’re not just nutritionists—we are pet owners and pet lovers too.